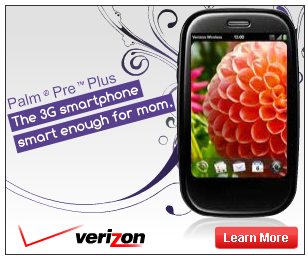 Verizon is finally advertising the Palm Pre Plus. This time around Palm and Verizon decided that rather than give you the creeps directly, they'll give you the creeps by scaring you with visions of the past. We like the target market here, but, well, "The 3G smartphone smart enough for mom" is completely true, accurate, but perhaps a little too ...direct? Swing of the pendulum, we guess: instead of a vague, hazy brand message we get "buy this for your mom." Roger that, will do, and she'll like it. She may not like the stereotype, though, even if it is presented just to be shoved aside by the Pre Plus. Women (and especially moms): What do you think? One more commercial after the break, thanks to windzilla for the tip!